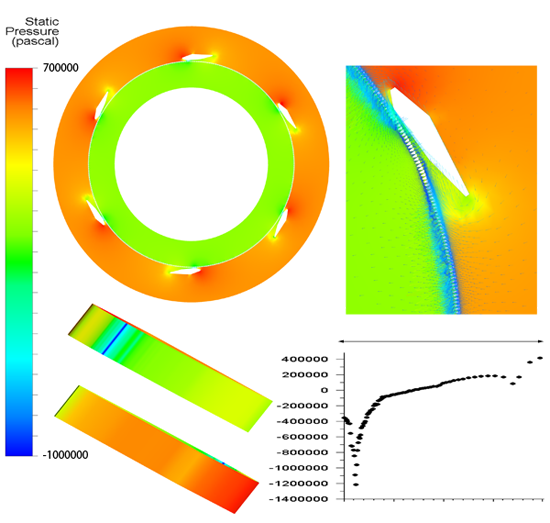 Computational fluid dynamics, CFD, is a versatile tool that provides a vast amount of information with one simulation. Phenomenon of interest could be heat transfer, mass transfer, flow fields, flow resistances, pressure impulses, phase changes, mixing, reaction speed, burning, precipitation, deformation of structure or solidification. Number of phases can be one or more. 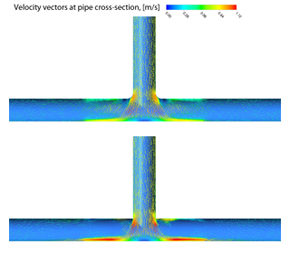 Some examples on flow simulation are presented below. Mixing and agitation can be interesting in various reasons. The objective may be uniform mixing of two or more phases. Mixtures components might all be fluids (gas or liquid) or also solid phase might be present. Sometimes agitation of just one phase is important for cooling or heating purposes. In addition, process optimization is relatively simple when compared to experiments and analyzing things, such as impeller blade shape, does not require building a new, expensive prototype. Cooling of moving object with liquid nitrogen. Governing phenomena are forced convection and conduction. 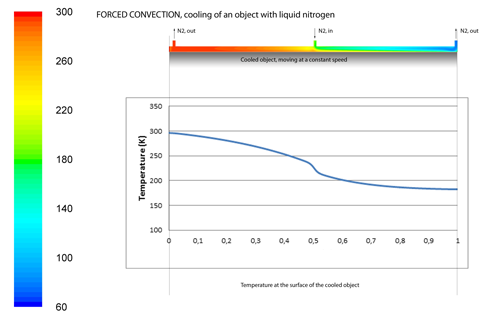 Above: temperature of nitrogen in the cooling chamber and the object’s surface temperature. In case of heat exchangers (below) CFD can be utilized to estimate the local surface temperatures, which are rarely uniform. Local cold or hot spots can cause unwanted condensation or liquid overheating. Also uneven flow distribution on the pipe side can unnecessarily decrease the heater efficiency. CFD was used to examine a solid surface temperature in a production process (below). Cooling agent was liquid nitrogen. The process required for the solid surface temperature to be in a specific range. 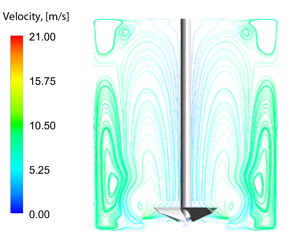 CFD was used to examine the effect of different feed arrangements and nitrogen flow rates. CFD can provide information about the pressure fields inside the equipment. Structure-wise, interesting could be flow driven pressure impulses or pressure fields at surfaces. Or merely pressure at specific locations. Too low pressure, for example, is a common pumping related problem resulting in cavitation. Structure related pressure fields can be used in structural optimization to ensure durability of the design. Also flow-structure interaction (FSI) analysis is possible. By combining ANSYS product family’s fluid dynamics (ANSYS Fluent) and structural analysis (ANSYS Professional) software in common user environment (ANSYS workbench) problem set up and information transfer is straightforward. 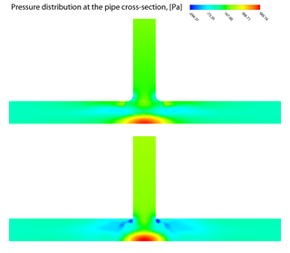 Effect of pipe connection shape to velocity (left) and pressure (right) profiles. Packed beds, filters, sieves, nozzles and equipment related pipe lines and connections in general cause pressure drop. Pressure drop can be compensated with, for example, pump or compressor. Fluid dynamics allows to analyze how the equipment design, operation and pipe lines affect the produced pressure drop. Thus ensuring optimal operation of the equipment and avoiding unnecessary power consumption. Pressure drop over stationary (above) and rotating (below) perforated plate. It is not always obvious, what is the reason why an equipment is not working as it should be. CFD provides us detailed information from inside the equipment that is usually invisible for us. Measurements give us some insight on what is happening. CFD simulations can provide us information on why. When we understand the phenomena behind the problems it is easier to modify the situation to the right direction. CFD is a useful tool also in equipment and process line sizing and optimization. 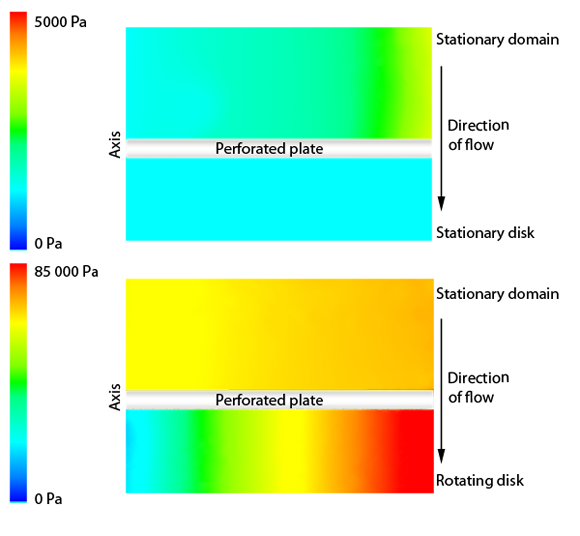 Although there is very good tools in various process design handbooks for equipment sizing (Balance calculation), computational fluid dynamics can be a useful tool to ensure, for example, even distribution of heat of flow. CFD results can be presented as illustrative temperature, pressure, velocity and phase/particle distributions. Also vector fields and streamlines offer a clear visual demonstration of the simulated phenomena. Results can also be translated into numerical values to help result comparison. For example average flow rate, pressure or temperature, total pressure loss, local flow resistances, impeller power number and reaction/burning rate. In addition CFD can be used to evaluate dynamic phenomena such as how long mixing, heating/cooling or tank emptying sequence takes. And above all, how the planned innovation effect the functionality of the equipment.